A fraction collector such as the Spectra-Chrom CF-2 is a necessity for any preparative liquid chromatography work. Whether purifying small samples with preparative HPLC or larger samples on open columns, it is neccessary to collect the different materials separated chromatographically in separate containers. The Spectra-Chrom CF-2 Fraction Collector is designed with a stationary drop head where the tubes move under the drop former, insuring every drop is collected. The Spectra-Chrom CF-2 Fraction Collector is a very durable general-purpose fraction collector that meets both preparative liquid chromatography and open column liquid chromatography needs. It is the successor to the workhourse Spectra-Chrom CF-1 Fraction Collector and features the same rugged drive and rugged metallic casework. 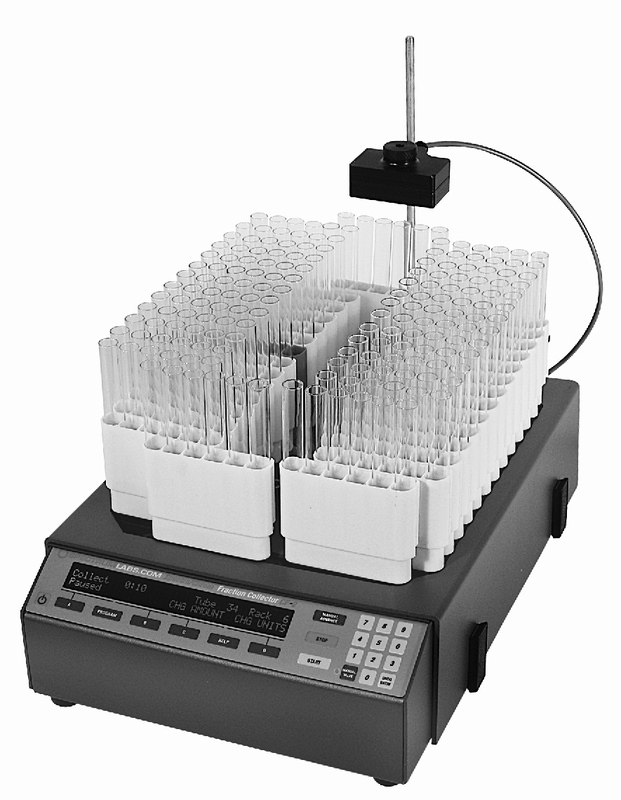 The CF-2 Fraction Collector can collect up to 174 fractions in standard 13 mm test tubes or up to 116 fractions in smaller 10 mm diameter tubes. For assaying after collection, the CF-2 can collect directly in 17 or 28 mm diameter scintillation vials. The CF-2 is sold complete and ready-to-use. It includes tube holders for 12 or 13 mm diameter tubes, a drop counter, and tubing fittings. All that is required is to add the test tubes. The CF-2 includes a powerful peak detector that allows for the separation of the low-level "in-between" material from the peaks. Simply connect the chart recorder output from the detector to the input of the CF-2 and different amounts can be collected in the peak and non-peak tubes. Peak material is more concentrated because of the separation from non-peak material. Add a 3-way diverter valve and it is possible to skip collecting the in-between material altogether! The Spectra-Chrom Model 280 UV Detector is also available from Rose Scientific and makes an ideal companion to the CF-2.